The Ultimate Guide To List Building! Do You Want To Learn How To Create An Email List Of Thousands? Yes? !...Then discover how to build an email list of 1000 subscribers in 30 days and profit from your first newsletter! In this eBook package you will find out the exact steps to become a Top List Building Authroity in any niche! As a special bonus, I will give you 3 FREE additional resources for taking action! Special Bonus 1: Point-by-point checklist - It is like a summary of the entire guide but in actionable, bite-sized points so that you can successfully get through the course. Special Bonus 2: Resource Cheat Sheet - You'll also get access to a rolodex of top sites, blogs, forums, tools, apps and services to get you even further. 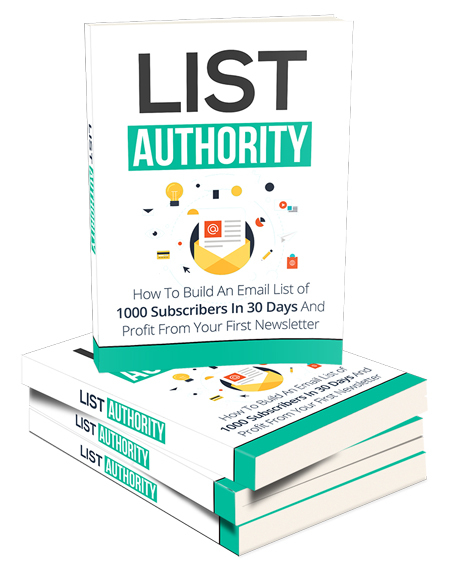 This is the ultimate and essential guide to building a successful email list! You'll discover all the steps, tools and resources to help you get started list building! Click the Buy Now button to get your copy today! Share this package for a 20% discount! Only Limited Copies Available - Get Instant Access Right Now!